The situation in the Darjeeling hills once gain became fluid with Bimal Gurung announcing a two-hour dharna by Gorkha Janmukti Morcha supporters barely 300m from Raj Bhavan when the Bengal cabinet would meet there today afternoon. The Morcha president said the party would announce a new round of movement if the cabinet didn't decide that Bengali wouldn't be compulsory at schools in the hills, Dooars and the Terai. The two-hour dharna on the road in front of Gorkha Rangamanch Bhavan is expected to synchronise with the cabinet meeting at Raj Bhavan. Gorkha Rangamanch Bhavan and Raj Bhavan are barely 300m apart. The chief minister had said in Mirik on Monday that Bengali would be an optional subject at the schools in the hills and certain pockets of the Dooars and the Terai. But Gurung said Mamata's words couldn't be taken at face value and decided to continue with processions on the language issue. Today also, the Morcha took out a march, after which a meeting was held at Gorkha Rangamanch Bhavan. Addressing the meeting, Gurung said: "Today, we will hold massive marches from Batasia (about 6km from the town) and Singamari (3km from here). Morcha supporters of the town will join the procession from Batasia near the railway station." Gurung said more than 30,000 supporters would take part in the two rallies which would converge on Gorkha Rangamanch Bhavan. "We will all sit on the road for two hours. After that, depending on the outcome of the cabinet meeting, we will announce our next step. The cabinet should take a decision tomorrow that Bengali will not be made compulsory in the hills, Terai and the Dooars. If such a decision is taken, we will thank her. If no such decision is taken, we will announce another round of agitation," said the Morcha president. The rallies are scheduled to start at 11am and reach the Gorkha Rangamanch Bhavan around 12.30pm today. A two-hour sit-in would then continue till 2.30pm at the earliest. The cabinet meeting chaired by Mamata is slated to commence at Raj Bhavan at 2pm. Police hadn't given permission to the Morcha to take out the march yesterday. There is no permission for today's processions either. The police didn't act against marches yesterday and today to avoid a confrontation with the Morcha. However, administrative officials are worried that a confrontation might take place today given the timing and the venue of the dharna. Movement of ministers and officials to Raj Bhavan is expected to start around 11am today. Any difficulty in the movement could result in a law and order problem. 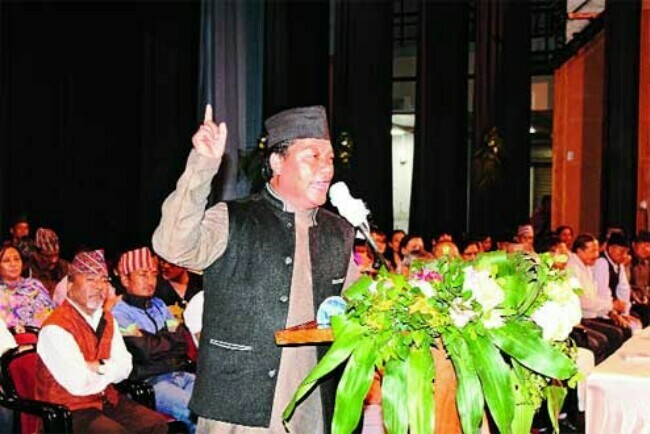 In his speech, Gurung launched a broadside against Mamata. "They are raking up the Madan Tamang murder case which is in court now. However, it was the same government that had slapped cases on Bharati Tamang and others when they launched a hunger strike at Chowrasta. Now, she is using the same issue. She talks about corruption at our end but her party and leaders are fighting graft cases," said Gurung. Even though he said the Morcha would announce fresh agitation if the cabinet did not take a decision as desired, he did at one time say in his nearly hour-long speech that the party was "watching" Delhi. "There has been a continuous attempt to suppress us on all fronts. However, you cannot stop the storm that is brewing now. It could take any turn. We are just watching Delhi and its reaction," said Gurung. A Morcha delegation, comprising Roshan Giri and three party MLAs, called on BJP state president Dilip Ghosh in Calcutta. The delegation also met governor Keshari Nath Tripathi. The team had met Assembly speaker Biman Banerjee in Calcutta last evening. The three were apprised of the developments in the hills regarding the language issue, said Morcha leaders.